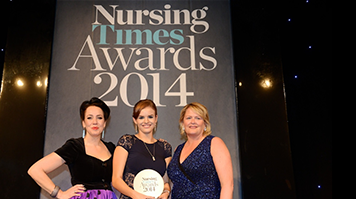 LSBU Mental Health Nursing graduate Emma Selby has won the Nursing Times Rising Star Award for 2014. Emma – who graduated in 2012 – triumphed in the prestigious category, which is given to a nurse who demonstrates exceptional qualities that embody the best of nursing and the leadership skills to inspire others to follow their example. Currently a Child and Adolescent Mental Health Services (CAMHS) community nurse with the North East London Foundation Trust in Waltham Forest, Emma was nominated by her patients – which she says makes the award even more special. Emma – originally from Walthamstow - said: "I am so proud and so honoured to have been named the National Rising Star Nurse of the Year. The fact my patients took the time to nominate me is very touching and to have won was beyond a surprise. "The awards are so important as they highlight the skill, compassion and love nurses up and down the country give to their patients every day and to have been named as a winner among them, I can't even begin to describe how that feels. "I am fortunate to have worked with some truly fantastic nurses who has shaped and inspired me into the nurse I am today, starting with some fantastic lecturers at LSBU who taught me so much about the art of nursing. Without my amazing lecturers I would not have been on that stage. "In my next year as Rising Star Nurse of the Year I shall be speaking at a number of conferences, universities and events about the importance of innovation in nursing and I hope to be able to inspire the next generation of nurses as much as LSBU inspired me." The Mental Health Nursing BSc programme at LSBU is designed to equip students with the skills and competencies to meet the challenges of providing effective mental health care.